Hawking and Penrose famously proved that a black hole must have a singularity in its center, such that the singularity has infinite mass density. Infinite mass density [mass density = mass ÷ volume] is what happens when a point-like location [volume = 0 m³] is filled with pure mass, or in other words, a point where mass is present but not physical space. Pure mass is a new concept (of physics), called massfluid by the author. However, the concept of massfluid and related physics are outside the scope of this book. Gravity and singularities are known physics, and these are the relevant concepts employed by Mass Vortex Theory. 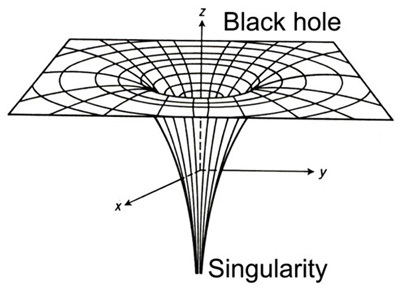 The idea of a singularity that has infinite mass density (an actual physical point) came from the work of Hawking and Penrose, and others, work that involved black holes and General Relativity. However, Mass Vortex Theory takes this idea of a point with infinite mass density to be an initial phenomenon that is a given of the theory. It is not due to the gravitational collapse of a star, for example. Mass Vortex Theory does not explain how the singularity at the beginning of a star system becomes present, it is a “given” of the theory. In the future, there may be more understanding about how or why infinite-mass-density singularities become present. But for now, we are not going back to the beginning of time, we’re starting with part of a nebula and an infinite-mass-density singularity. Some people claim that a given physics equation blows up at a singularity becoming meaningless. However, consider that the equations of physics – the ones that involve space and movement in space – are not defined at such a point since space is not present there. So such reasoning, to justify the rejection of singularities, makes an improper assumption. The current geometry for space-time does not take into account the ways in which massfluid cuts through space. Note that infinite mass density is not the same as infinite mass. A sphere with a radius greater than zero around such a singularity will have a measurement of finite total mass. In fact, the infinite-mass-density singularity of a galaxy is routinely .1% of its bulge mass for galaxies that have a bulge and have been investigated closely. The singularity is a point location that does not have a surface for reflecting optical light waves. At the point location of a singularity, the light waves do not behave the way we need them to in order to see something. Infinite-mass-density singularities are often misrepresented visually, as explained by Suresh Emre, a physicist who has worked at the Fermi National Accelerator Laboratory on his blog: https://sureshemre.wordpress.com/2012/04/14/infinite-curvature-of-spacetime-singularity/ The following is a quote from this blog post. This visual representation is misleading because the spacetime curvature in a singularity is infinite but in this representation the curvature at the singularity is almost zero. During the approach to the singularity the curvature of spacetime will increase not decrease. Spacetime is a composite of 3 spatial dimensions and 1 temporal dimension. It is impossible to visualize the “infinite curvature” of a 2-dimensional surface. The visualization of the “infinite negative curvature” of 4-dimensional spacetime is totally beyond our mental capabilities. We cannot visualize perhaps but we can still think about the spacetime singularities in abstract terms. As a drain or sinkhole for mass, particles are swirling around the singularity in tight circular paths moving with high energy, so they luminesce (i.e. give off light). This is why the center of spiral galaxies glow so brightly in space. Featured image: Shows region surrounding the singularity at the center of our galaxy. Image caption from National Radio Astronomy Observatory [NRAO]: “Radio continuum emission at 3.6 cm from the inner few parsecs of our Galaxy. The bright point source in the center is Sagittarius A*, which is likely a black hole at the center of the Galaxy. The mini-spiral of emission around the point source is from ionized gas that is in systematic motion about Sgr A*.” | Credit: Roberts et al. NRAO / AUI ./ NSF Investigators: Roberts, D.A., Yusef-Zadeh, F., Goss, W.M. * A point is a location in space without distance or direction.